How does dish washing work? 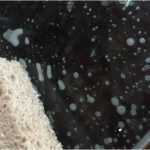 Surfactants have seemingly magical properties: combine greasy plates with dish washing liquid and hot water and the dishes become squeaky clean again. So, how does that actually work? Detergents are often amphiphilic molecules which means that have both a hydrophilic and a hydrophobic end. 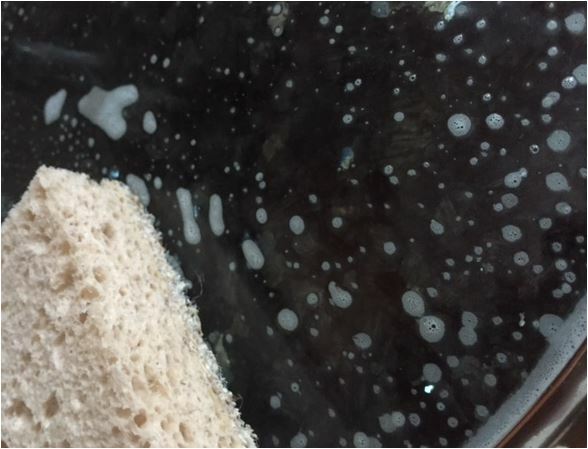 If the detergent concentration is high enough (that is above the cmc or critical micelle concentration) the fat friendly ends self-assemble into micelles with the water-friendly ends sticking out into the surrounding water. 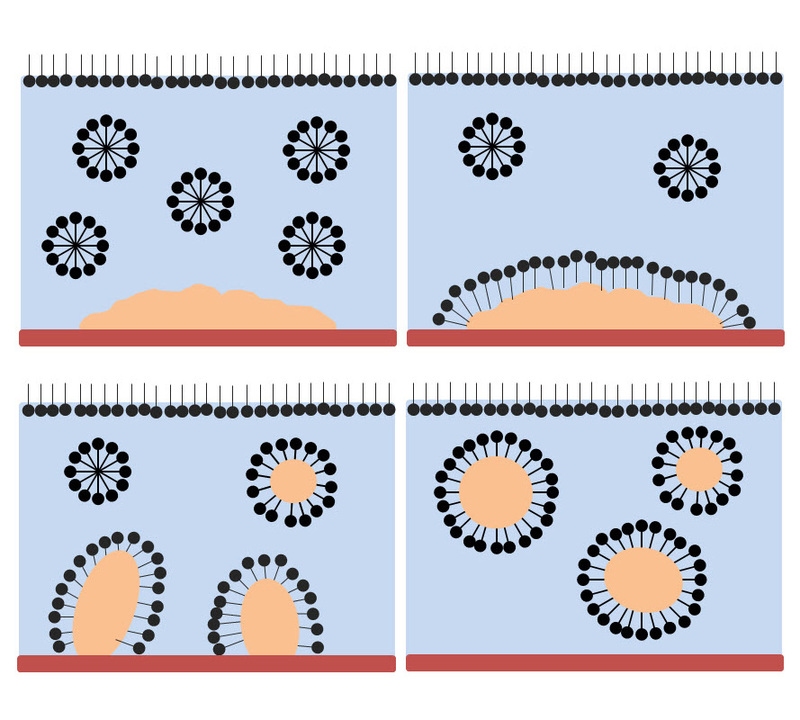 When the micelles comes in contact with a blob of fat, the fat-friendly ends can help to integrate part of that “dirt” into the micelle, and then magically float away while held inside the complex, as in the sketch shown above. High temperature will help to add thermal energy and make the long fatty chains more pliable and less reluctant to leave their spot on the dish. This description and sketch are somewhat simplified and a lot more goes into the perfect formulation of a hand dish washing liquid (just to mention a few practical concerns: pH, phosphates, biodegradability, irritability, preservatives, fragrances, color, foaming, rheology). In a paper which came out earlier this month titled “Improvement in the Safety of Use of Hand Dishwashing Liquids Through the Addition of Hydrophobic Plant Extracts” by Tomasz Wasilewski, Artur Seweryn, and Maciej Krajewski the authors investigated the addition of chamomile extract to hand dish washing liquid. They showed a reduction in skin irritability and included Dynamic Light Scattering (DLS) data from a Malvern Zetasizer Nano. The added oils from the plant extract lead to the formation of additional, larger complexes of a few hundred nanometers, whereas the plain dish washing formulation consisted of sub 10 nm diameter micelles only. They state “Large-sized particles which are observed in the solution most likely represent aggregates arising from the process of micellar solubilization of the hydrophobic plant extract.” At high chamomile concentration, the solution becomes visibly turbid due to the increased scattering from the larger particles. Interestingly, the pH increasing effect on a model BSA solution is reduced, and surfactant molecule interactions with skin proteins are somewhat hindered, leading to reduced skin irritation potential. Earlier this week, Ana Morfesis gave an online presentation titled “Zeta potential – an important parameter for controlling formulation stability and product performance” which may be of interest. Not only size but the charge will be influenced by the formulation components. Why are my particles too small? If you have any questions, please email me at ulf.nobbmann@malvern.com. Thanks! While opinions expressed are generally those of the author, some parts may have been modified by our editorial team.